I consider myself a knife guy. Not like the guys that have an obsession with collecting every knife out there, but in that I always have one with me and I really appreciate a quality knife. Over the years I’ve moved from fixed-blade knives to folders and back to fixed-blades. 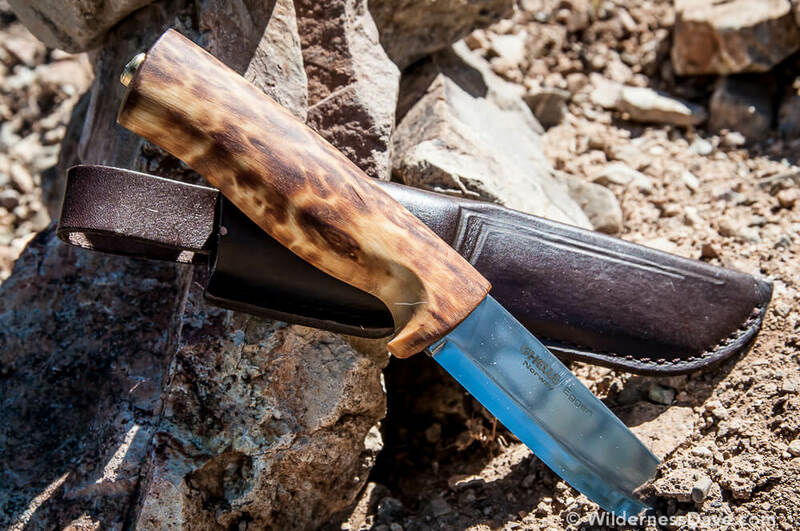 In the backcountry I definitely appreciate the reliability and sturdiness of a good fixed blade knife. 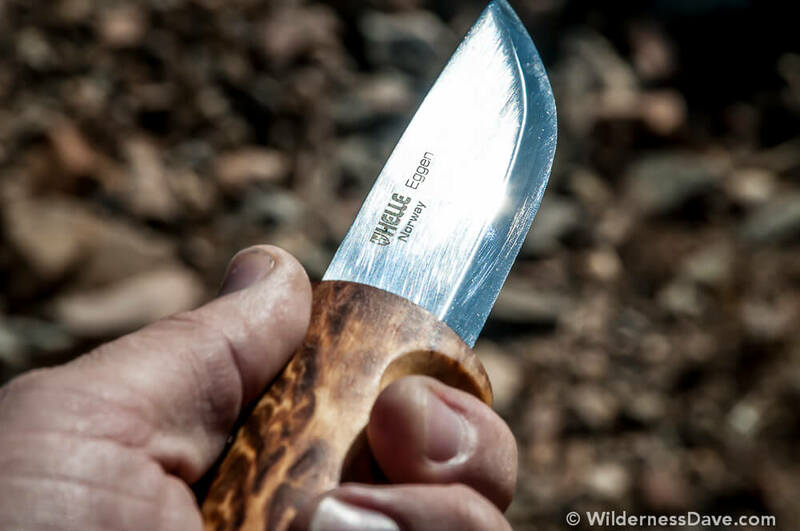 Others have reviewed knives from Helle and they usually get pretty positive reviews, so in my search for a great outdoor knife for backcountry use I really wanted to get my hands on one to see what the hype was about. I wasn’t disappointed. I met with the guys from Sport Hansa at the OR Winter Market in Salt Lake City last January, they are the distributor for Helle Knives in the US. I talked to them in length about the knives and what makes them special. I followed up after the show and asked if they’d be willing to send one out for review and they graciously sent me the Helle Eggen…one of Helle’s most popular all around outdoor knives. Out of the box this is a gorgeous piece of hardware. The Curly Birch handle is very attractive and fits nicely in the hand in any position. The blade is a beautifully executed, polished steel and is easily the sharpest knife I’ve ever had without taking it to a stone myself. At about 4oz it’s a light knife but doesn’t feel flimsy or weak like a lot of lighter knives. The leather sheath is a really nice addition as well. It’s well made with some simple yet attractive tooling on it. I’m no major collector but I’ve had (have) probably 40+ knives in my time and this blew away a lot of the competition straight out of the box. Over time you get used to handling knives. I admit I underestimated the blade on this knife and cut myself the first time I took into the field. It was barely a nick, but that blade is so damn sharp it didn’t matter. I learned to be more aware when handling the Eggen. I look for a couple distinct things in an outdoor knife. First, how does the knife handle? Knives are multipurpose tools and they are never held or used in a single specific way. It has to be comfortable in many positions, cutting from different angles, in varied conditions. The Eggen performs well all around. The handle is shaped well for any grip position and the Curly Birch performs dry or wet. The blade is the perfect length and wide enough to give you leverage without being so wide as to compromise precision. I like the drop point blade design and the slight overall curve of the knife. I also look for durability. I’ve only had the knife for about six months and had it in the field with me on a little over a dozen trips. I’ve used it to cut rope, leather, rubber, plastic, wood and food (I’ve even used it to shave). The edge has held up amazingly well and the handle and blade look brand new. It will take a lot more time to really judge durability but I’ve had much more expensive knives that have shown wear and tear earlier and faster than the Eggen. If you’re looking for a nice fixed blade outdoor knife you can’t go wrong with the Helle Eggen. If all Helle Knives are produced as well as this one then I see a few more of these in my future. I have been extremely happy with the performance and handling of this knife and it’s a beautiful piece of equipment. All Helle Knives are made in Norway with the same attention to detail and quality they’ve maintained since the Helle brothers started production on their farm 1932. Bottom line…I would trust my life with it.